In a reversal of roles from our lasting outing with Maurice, Nick was Marlborough and I was Marshall Tallard. We used the terrain placement system from the rule book this time and as the British won the scouting roll and I didn’t have any 15mm buildings he plonked a hill down on the very edge of my deployment zone knowing this would be the objective. I put a wood in front of the hill in his deployment zone to disrupt his deployment and his solution to this was worthy of Marlborough. 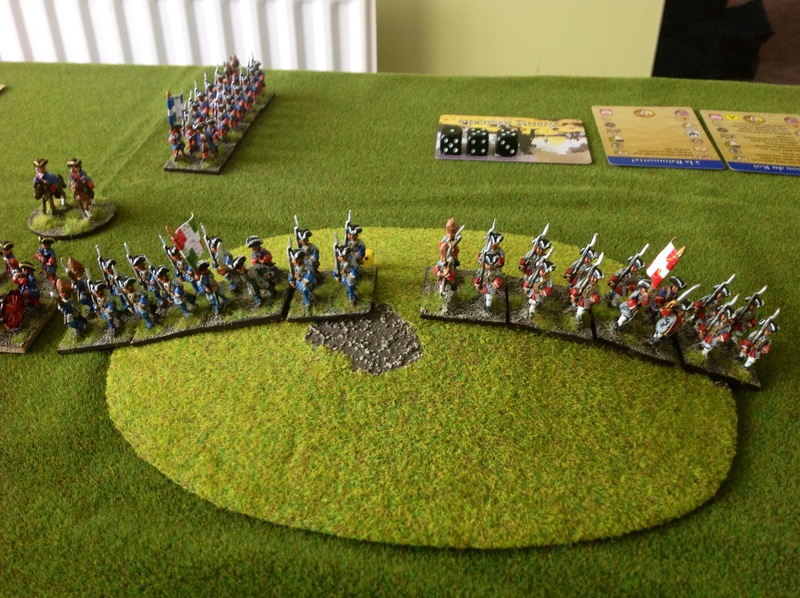 With the hill as the objective I was left with no option but to defend it, so the Garde Francais infantry formed up to advance on to the hill in the middle of a two-ranked line of infantry flanked by cavalry and artillery. 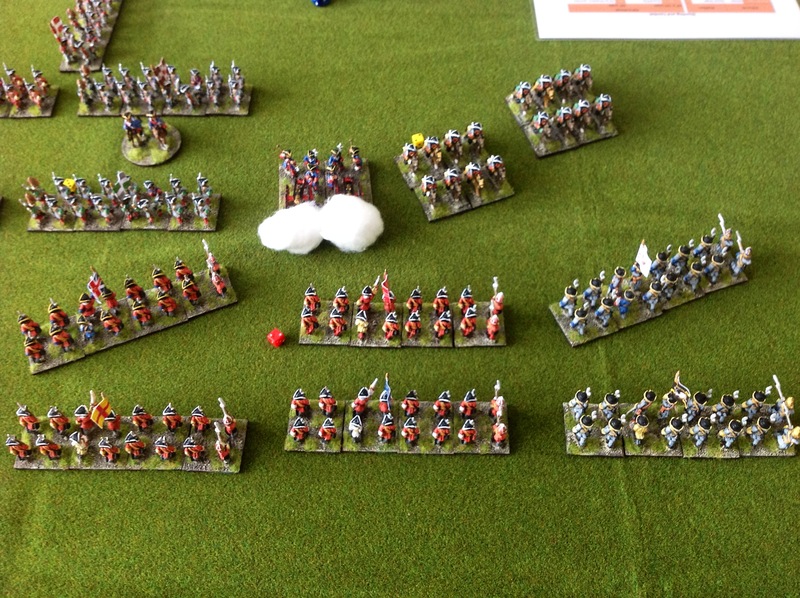 The British decided to assault the hill (something I had declined to do in the last game with the Garde on it) with his 6 British battalions, placing 2 cavalry on his right flank and 2 Dutch battalions with 2 cavalry and all his artillery on his left. 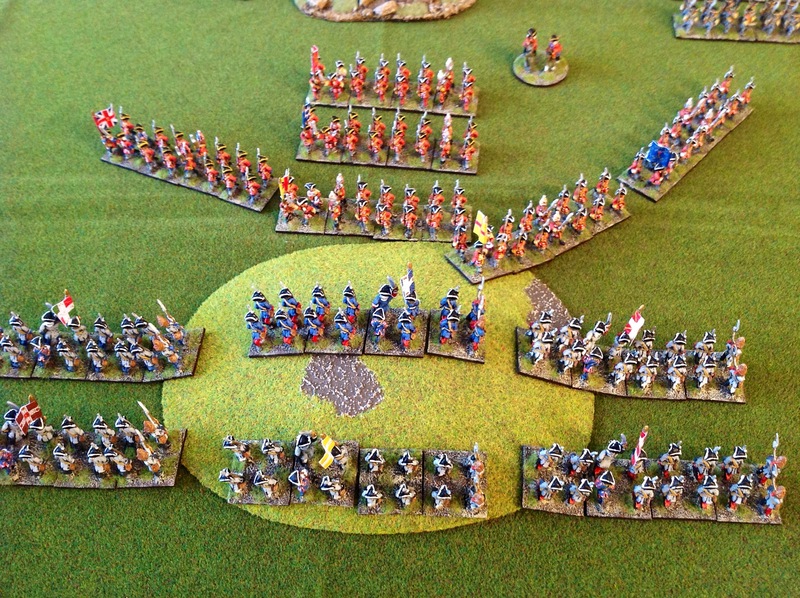 The British national advantage in musketry failed to make an impact and surprisingly I was able to keep up with the lost disruptions by rallying actions which also gave me 2 cards and enabled me build a hand to counter a lot of the cards which the British were playing to force me off the hill. 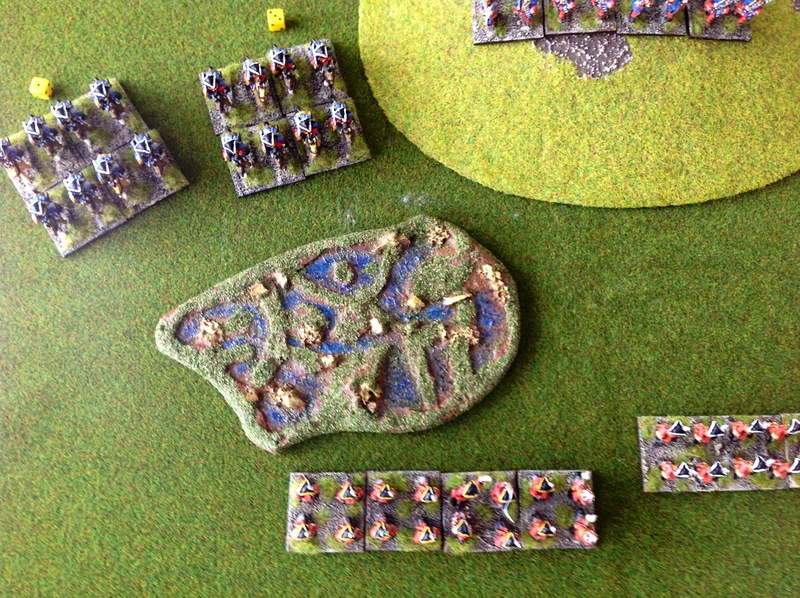 The French Guard knew they may not stand much chance in a firefight so charged the first unit on the hill, doubling them in melee and wiping them out. 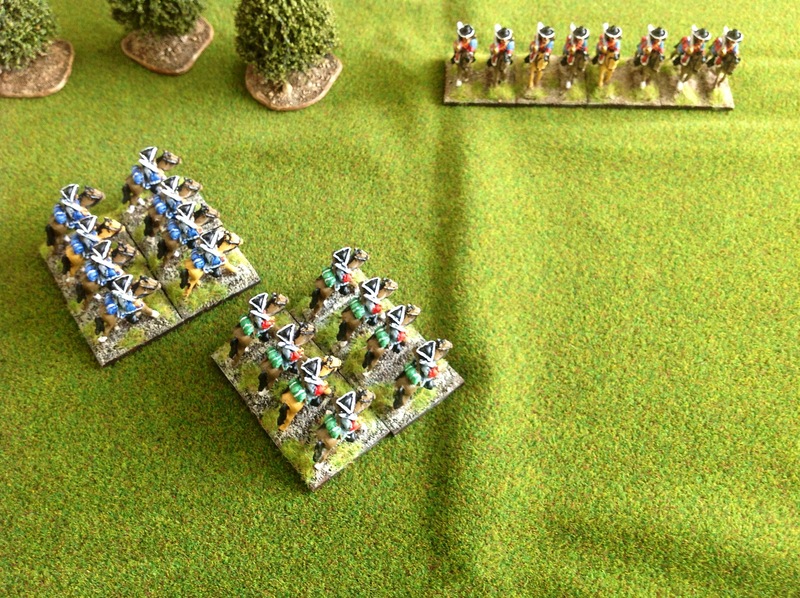 After cancelling the next volley phase through the use of a card, the Guard fell back to the top of the hill, forcing the British to follow them to get in to musket range. 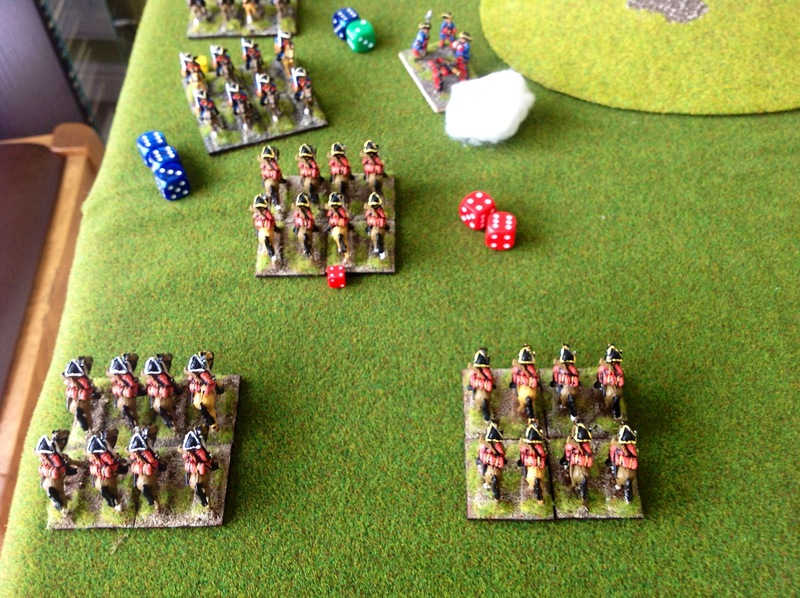 So the British became fixated on the hill which was the objective and the game degenerated into a series of frontal assaults by his infantry with my French infantry rallying off the disruption from British lethal volleys then following up with the bayonet national characteristic when his rally failed (a pretty sound tactic I thought and not something I could complain about as it was burning through the deck). 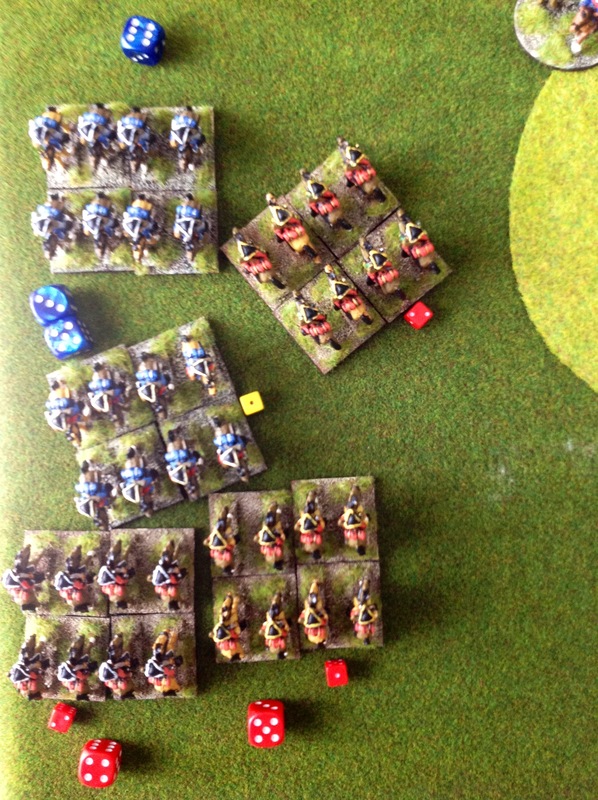 Even when a British cavalry unit intervened, I luckily had a “That’s not on the Map” card to play, which ruined their chance at a flank charge on one of my infantry units supporting the Garde. 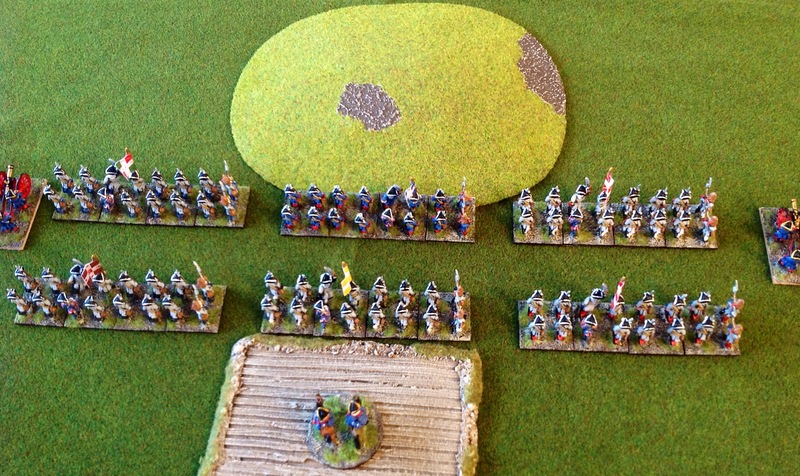 Eventually, the British attack on the hill ran out of steam with the French infantry more-or-less intact. To be fair, I was lucky that the British “lethal” volleys were somewhat less than lethal but assaulting French guard on a hill might be a bad idea under any set of rules. 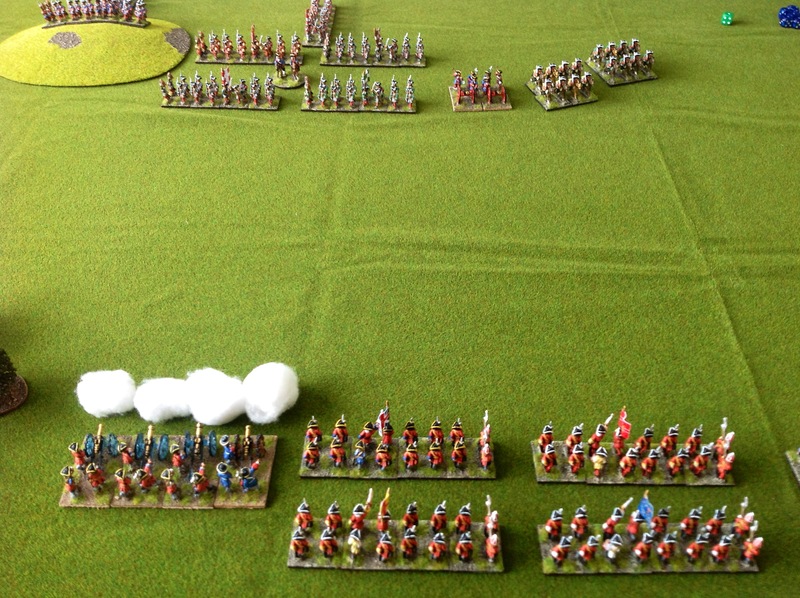 At the end, I was thanking my lucky stars that the British did not use the Great Commander card to move his general out to flank for free having pinned me on the hill – he outnumbered me on the flank, and had concentrated all his artillery there. 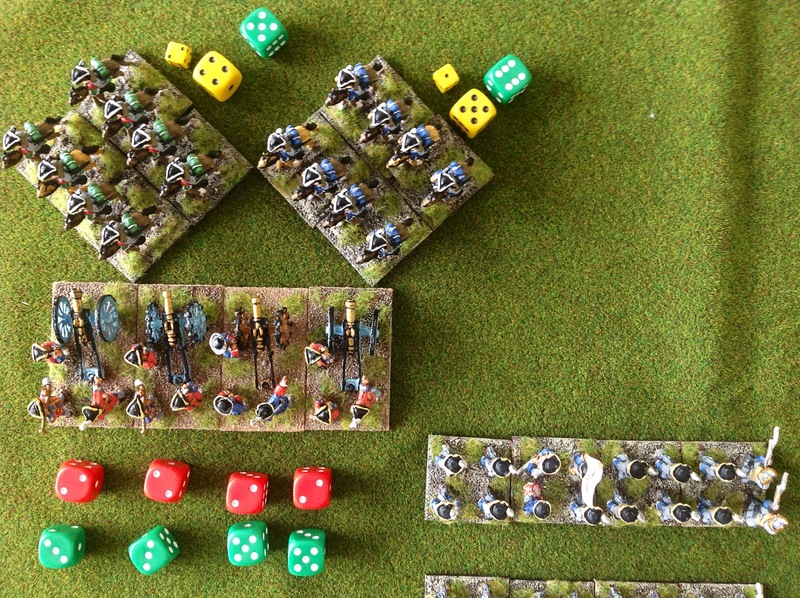 The one turn he did bombard he put 2 disruption on a cavalry unit which is hard to rally off (5 or 6 needed) and even harder to fund with cards if they are 16″ from the general – a couple more turns of that might have really paid off. 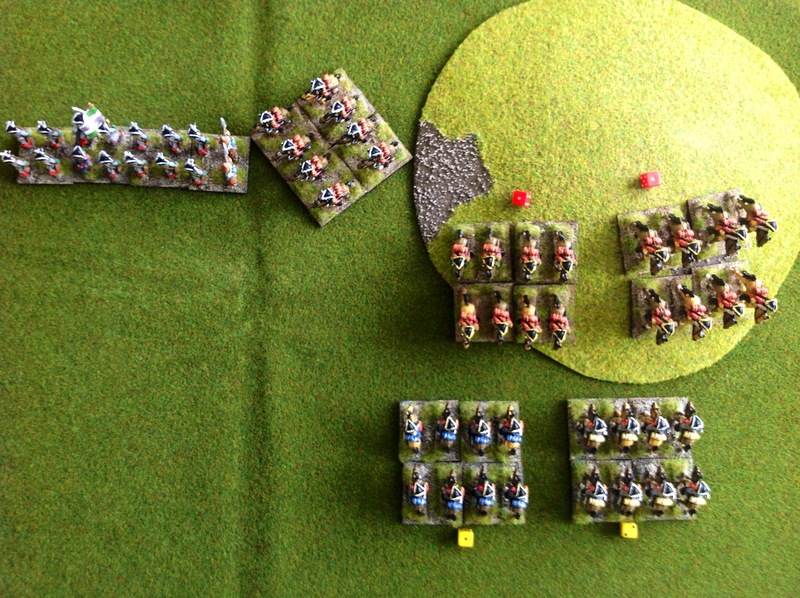 Also, my general had to discard cards to move so it would have cost me to move to the flank. 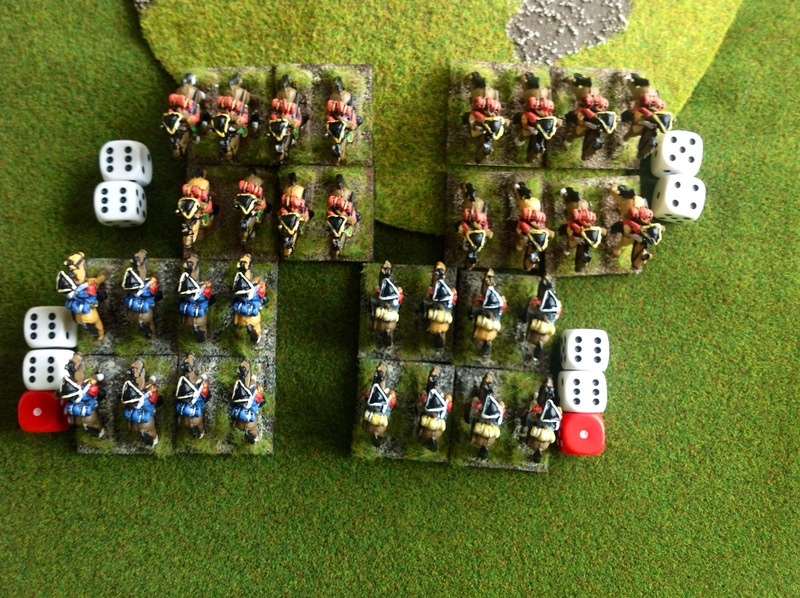 Morale at the end was 11 for the French from a starting 15 while the British were down to 3 having lost 5 infantry and 1 cavalry unit and rolled high on the morale loss table. 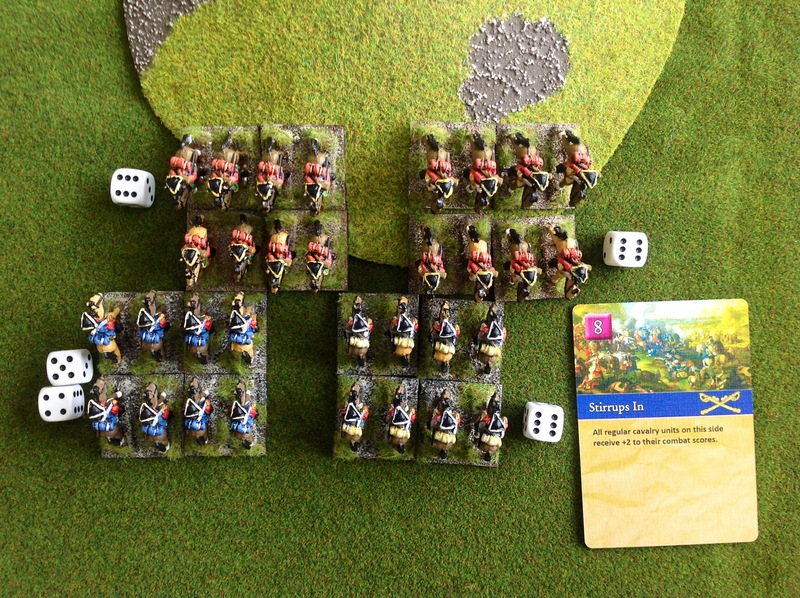 Anyway, there was a bit of post-match debate with the British commander convinced that rallying is too easy and the lack of real casualties in the game is a weakness as it means that units can rally to fresh state and still get 2 new cards (unlike Field of Battle 2 where the loss of UI, though it can also be rallied off still gives loss to army morale). I on the other hand just put it down to bad dice rolls for the British shooting and good rolls for my rally rolls, though I do accept that perhaps getting 2 cards for a rally makes it too much of a no-brainer for the defender. 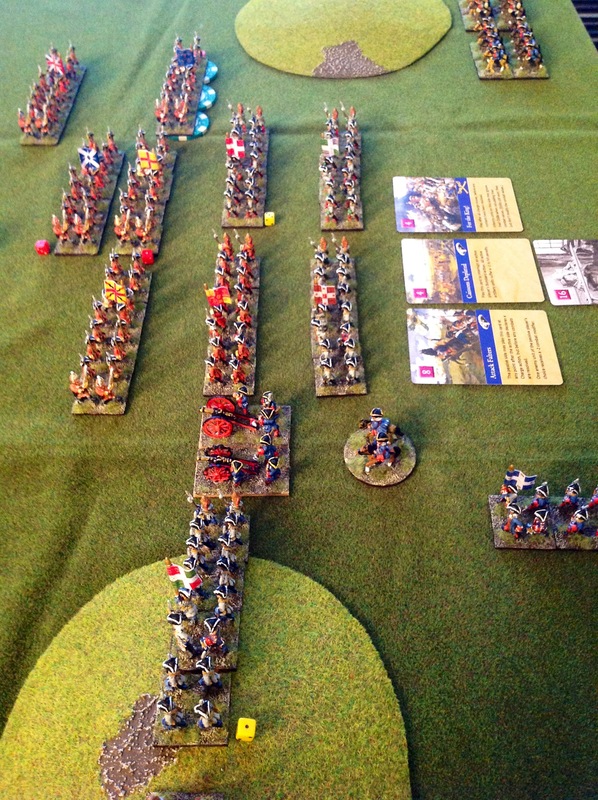 However, a British attack which rolled up my flank while pinning me on the hill might have succeeded and possibly broke my morale – concentrating on attacking the hill allowed me to use all my cards for rallying if I chose. So the up-shot is that I’m not sure that we’ll be using “Maurice” again which is a real shame – a case of I liked them but my regular opponent didn’t. 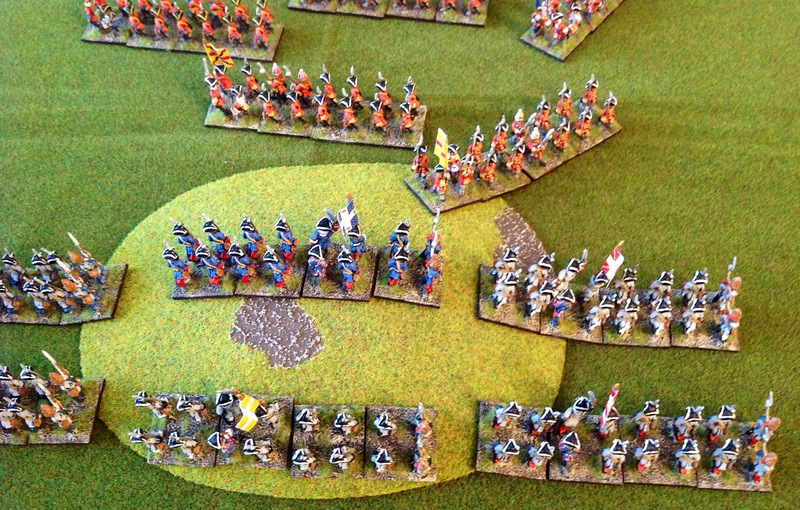 Our search for a rule set we both like for the period continues and will visit Field of Battle 2 in the near future. 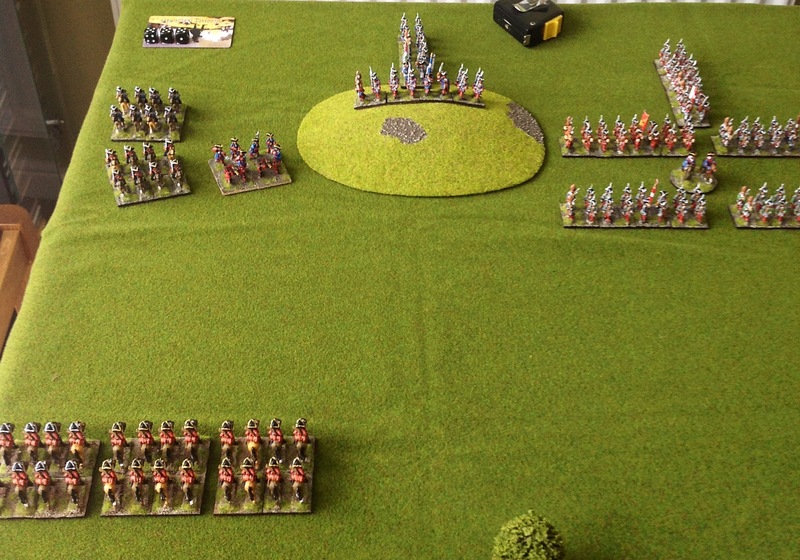 On a brighter note, Sam Mustafa has announced “Longstreet”, an ACW ruleset which is brigade-level and card-driven and I have shed-loads of Reb and Yankee troops already painted and ready to go – can’t wait!